We are currently hanging out in the Pacific Northwest and yes there really are towns in northwest Oregon by those names. We were in Portland for three weeks before moving a little south. We have 2 married daughters and 2 grand kids there and there was lots of visiting and eating out and even a sleepover with the grand kids on the RV. Strange how we can go a couple of weeks without eating out when we are by ourselves. But if you are a confirmed foodie, like I am, then Portland is the place to be. We have sampled Vietnamese, Mexican, German, Mediterranean, Micro Brewery Pub Grub, French, Thai, Gluten free pizza, and of course several great home cooked meals. We also made some new friends while in town. For years we have followed Thom and Dar. They are from the Midwest like us and also, like us, have kids in the Pacific Northwest. We have never been able to meet up until now. While our visit was short, we enjoyed our time together and look forward to our next visit. We also met Jeri and Terry, you can read about their travels at Just Wanderin. We have followed each other for a couple of years, and when Jeri emailed us about getting together we jumped at the chance. They are from the Pacific Northwest and are getting ready to head south. They brought another couple, Carol and Steve with them to join us for lunch. They are from Oklahoma and were staying at the Elks in Vancouver with Jeri and Terry. We hope to meet up with both couples again in a couple of months in a warmer climate. Speaking of the Elks, since we are going to be here in the Portland area until Thanksgiving we decided to go through the process of joining the Elks. Jeri and Terry kindly sponsored us and we appreciate all their help. We are going to be taking advantage of cheaper monthly rates and stay in the McMinnville area for a month. Close enough to Portland to drive in to see everyone and yet out far enough to be a little more reasonable. 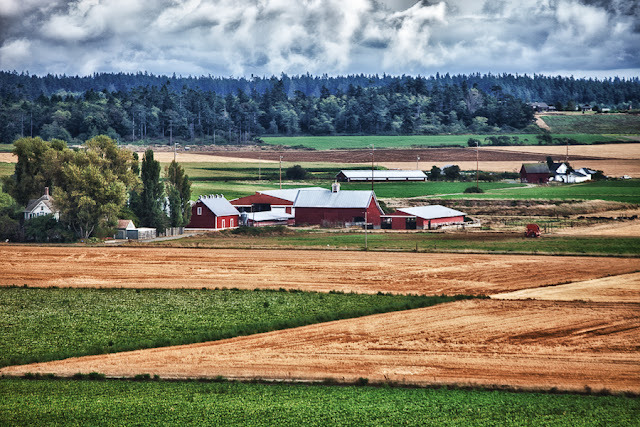 We will be in prime vineyard country, close enough to visit the coast on a day trip, and hopefully even visit the great air museum in McMinnville, home of the Spruce Goose. The new header picture is from our visit to Mt Rainer. The picture below is from Ebey's Preserve on Whidbey Island.